The swim bladder is an air filled organ used by some fish to maintain buoyancy at a desired depth and produce or hear sound. Physostomous swim bladders are directly connected to the gastrointestinal tract so that fish with these swim bladders, such as herrings, must “gulp” air to inflate their swim bladder and “burb” or “fart” air to deflate them. Physoclistous swim bladders are not connected to the digestive tract so that fish with these swim bladders must diffuse gas from the blood to fill and collapse them. For many fish, the swim bladder has the additional role of transferring sound waves to the auditory system. And in some fish, such as drums and croakers, the swim bladder is used to make sounds and communicate with one another and other fish. Fish use swim bladders for buoyancy, hearing, and producing sounds. This goldfish uses its lateral line to orient upright in the water (Pogrebnoj Alexandroff). The lateral line is, literally, an observable line down both sides of a fish. It is also a sensory organ system that helps fish detect motion in the water around them. When water along the lateral line is displaced by movement or a vibration nearby, hair cells (similar in form and function to hair cells in a human ear) translate the displacement into an electrical impulse that is transmitted to the brain. The lateral line helps a fish orient itself upright in the water and relative to other fish (e.g., schooling fish or predators and prey). 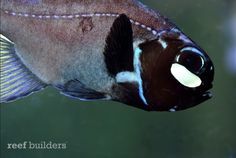 Photophores from a Splitfin Flashlight Fish can be seen from 100 ft away! Photophores are organs that are used by fish (and invertebrates) to produce light either by chemical reaction or through symbiotic bacteria capable of bioluminescence. Most fish that use photophores live in the deep sea where light from the surface is limited. Like a firefly in the sea, some of these fish use photophores to attract mates; others use photophores as counterillumination and camouflage; others use their photophores like search lights to find prey or avoid predators; and still others use photophores for multiple purposes. Splitfin Flashlight Fish (Anomalops katoptron), for example, use their photophores to communicate with other flashlight fish, attract prey, and confuse predators. They are believed to produce the brightest bioluminescence of any organism – their light can be seen from over 100 feet away! For other examples of fish with photophores, check out the “twinkle twinkle little fish” post on the Fisheries Blog! 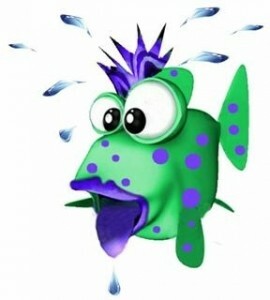 Fish don’t sweat to regulate their body temperature but they do have strategies for thermoregulation (www.fishlady.us). Thermoregulation is the process by which an organism controls its internal temperature. Fish have many different mechanisms for regulating their temperature. Most fish are ectothermic, using their environmental temperature to manage their body temperature, but some fish are endothermic, having the metabolic ability to internally manage temperature. Poikilothermic fish are ectotherms which have no control over their body temperature; their core body temperature conforms to ambient temperature. Eurythermic fish have evolved to survive in a wide range of environmental temperatures and stenothermic fish have evolved to survive in a narrow range of environmental temperatures. Thermoregulation is very important for fish because temperature influences the function of many organs and the rate of many metabolic processes. Most fish species have evolved to survive within a specific temperature ranges; outside that range, enzymes can degrade, organs can fail, and the organism can die. Understanding thermoregulation for fish species is particularly important when considering implications for climate change. 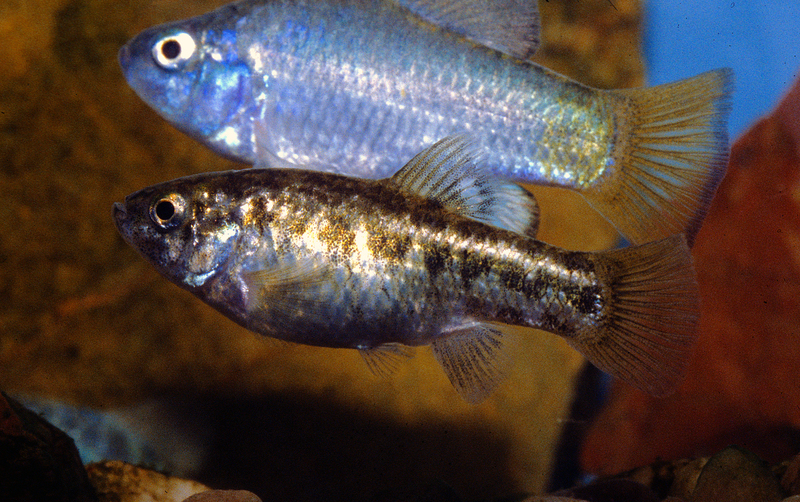 Desert Pupfish are eurythermic, surviving in temperatures ranging from function in waters from 4º to 45ºC (Paul V. Loiselle). In contrast to stenotherms, eurythermic fish can function at a wide range of water temperatures. They are often, but not necessarily, ectotherms. 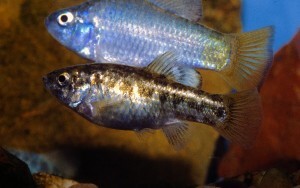 Desert Pupfish (Cyprinodon macularius), for example, can function in ambient temperatures ranging from 4 to 45 degrees Celsius. This thermoregulatory strategy requires that organs, enzymes, and metabolic processes can operate at varying environmental temperatures. 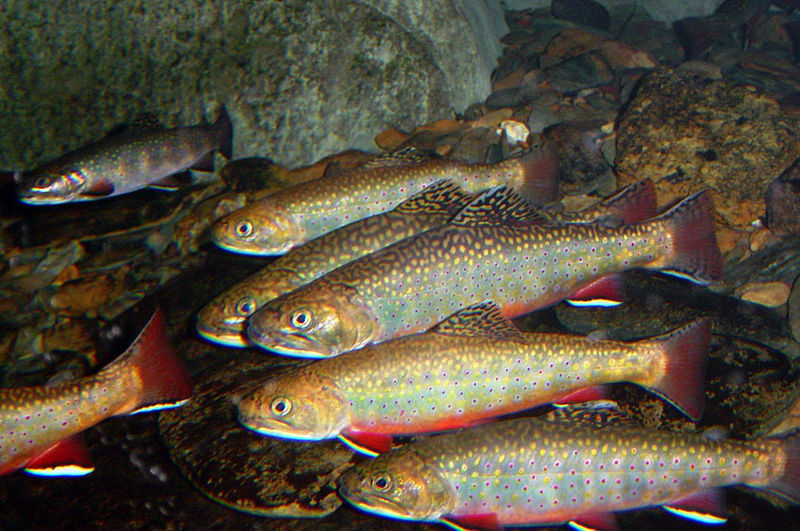 Brook Trout can only survive in a narrow band of temperatures (FWS). In contrast to eurytherms, senothermic fish can only function in a narrow range of water temperatures. Brook Trout (Salvelinus fontinalis), for example, function optimally approximately between 13 and 18 degrees Celsius. This thermoregulatory strategy requires that organs, enzymes, and metabolic processes operate in a small temperature band and makes these fish particularly vulnerable to environmental changes. Ectothermic fish rely upon their environment to regulate their temperature (clipartOf.com). Unlike endotherms which can metabolically control their own body temperature, ectotherms rely upon environmental temperatures for thermoregulation. Most fish are ectotherms. Ectothermy can be metabolically more efficient than endothermy because organisms do not have to expend any energy to self-regulate their body temperatures. However, they are at the mercy of their environment more than endotherms because they use ambient water temperature to control their body temperature. Poikilothermic fish have no control over their body temperature whatsoever. Their core body temperature conforms entirely to ambient temperature and can fluctuate widely. This means that their organs and enzymes need to be capable of functioning at a range of temperatures. As physiological processes have often evolved to operate most efficiently at certain temperatures, ectothermic fish have evolved multiple strategies to maintain optimal thermal habitat. Stenotherms live within narrow environmental temperatures in contrast with eurytherms which can live in a wide range of environmental temperatures. 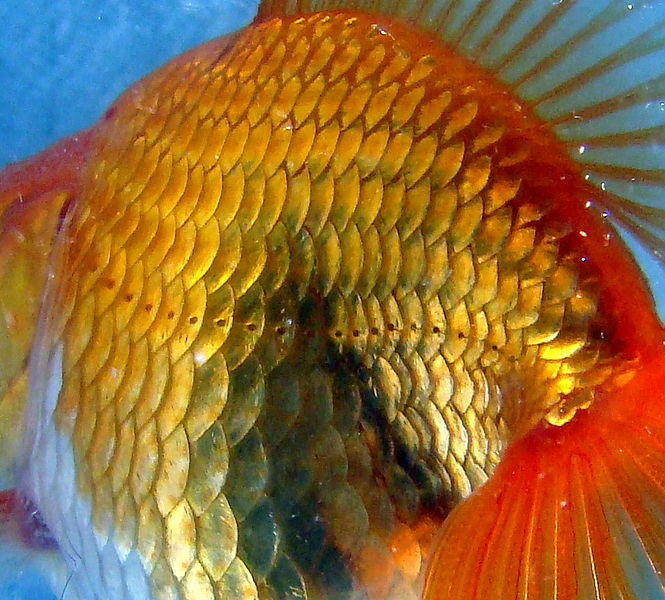 Though rare, some fish are able to internally regulate temperature. Unlike ectotherms, which rely upon environmental temperatures, endotherms are able to metabolically control their body temperature. 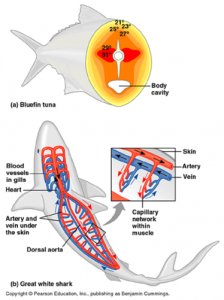 This thermoregulatory strategy is rare among fish but is present in tunas and some sharks, including the Great White Shark (Carcharodon carcharias) and Shortfin Mako Shark (Isurus oxyrinchus). Endothermic tunas and sharks use a network of capillaries in their swimming muscles, the Rete mirabile, as a heat exchanger. Through counter-current exchange, the heat produced through muscle activity is transported by the blood. Through this metabolic process, sharks, for example, can maintain a body temperature of 5 – 14°C above ambient water temperature. This process is an evolutionary advantage for these long distance, migratory fish, allowing them to travel extensive distances and dive deep while maintaining body temperature, conserving energy, and avoiding thermal shock from changes in water temperature. Tunas are one example of endothermic fish. An oceanodromous fish, like an anadromous or catadromous fish, is a migratory fish. Unlike anadromous or catadromous fish, an oceanodromous fish spends its whole life in salt water. 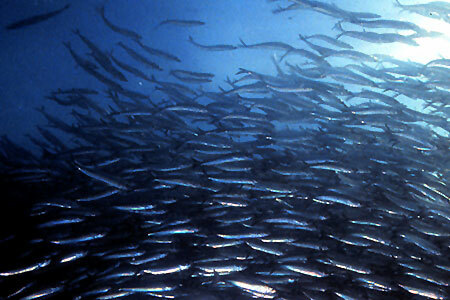 Many oceanodromous fishes are termed highly migratory species (HMS) because of their ocean basin-sized migration routes. Many HMS are high trophic level fish and they migrate in search of food in addition to spawning. 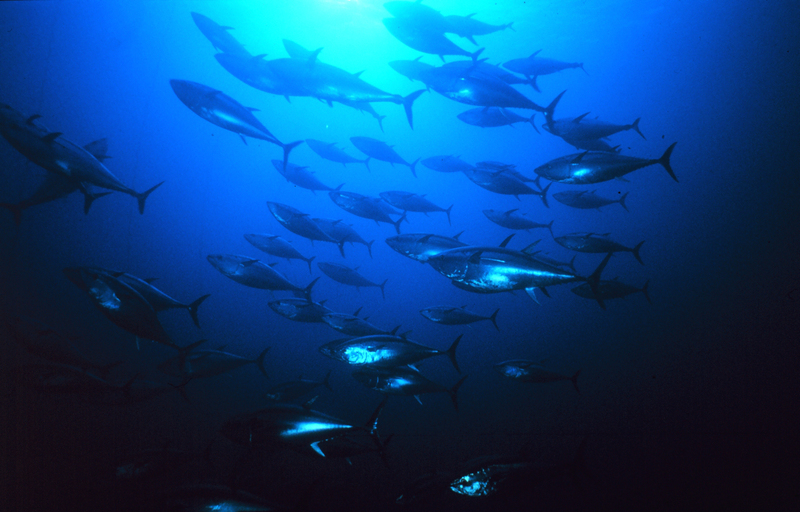 Endangered Atlantic Bluefin Tuna (Thunnus thynnus) are one example of a HMS, high trophic level, oceanodromous fish. They spawn in the Gulf of Mexico and the Mediterranean Sea. Tagging studies show that the feed all around the Atlantic basin. Highly prized on the sashimi markets, bluefin spawning aggregations and schooling behavior make them particularly vulnerable to modern fishing techniques. 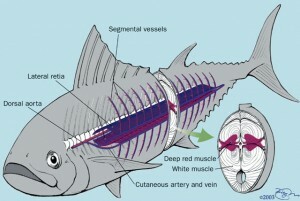 Atlantic Bluefina Tuna are an example of an oceanodromous fish which is highly migratory but only lives in salt water.